Jelix : Forums - [Opened] Booster : live ! Others topics >> Booster : live ! [Opened] Booster : live ! This portal will offer a central and unique repository to the community, of all the resources available Jelix produced by each of us, especially to add his own creations and install those of others the simplest way of the world with the powerful installation system of the framework. 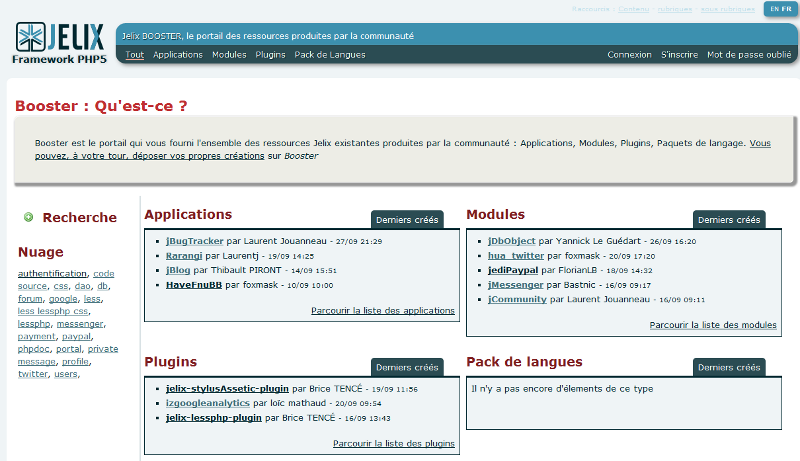 Thus, we find as well, complete applications, ready to use, as small or large indipensables plugins and modules. This project has been done with the assistance of FlorianLB, FoxMaSk and under the leadership of Laurent and we hope you have as much fun to use it we had to design it.